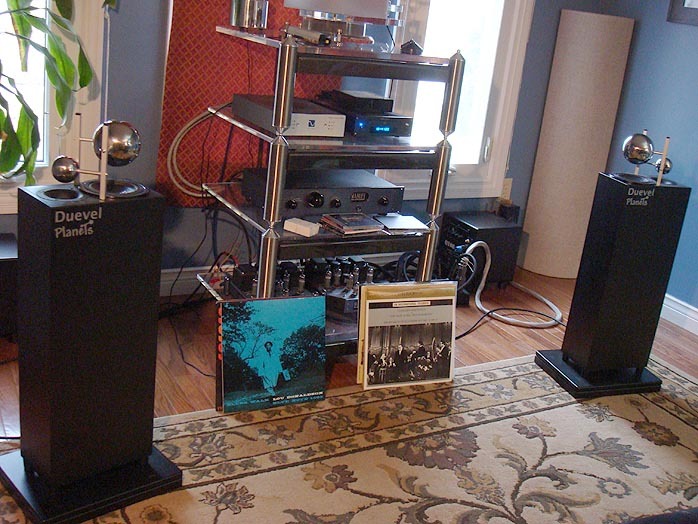 Preamp/Integrated: Manley Labs Shrimp, Audio Zone AMP-1, Pro-Ject Tube Box SE phono stage. Speakers: Green Mountain Audio Callisto (on sand filled Skylan stands), Hornshoppe Horns, AV123 Strata Minis, (2) REL Q108 Mk II subwoofers. Cables: Audience Maestro & Auditorium 23 speaker cables, Audience Maestro, JPS Labs Superconductor+ & Silver Fi interconnects, Stereovox XV2 digital. Power Cables: Audience, Harmonic Technology, GutWire. Powerline conditioning: BPT Pure Power Center w/Wattgate 381 outlets, Bybee Quantum Purifiers and ERS cloth, GutWire MaxCon, Audience adeptResponse aR1p. Sundry accessories: Grand Prix Audio APEX footers, Isoclean fuses, Caig Pro Gold, Auric Illuminator, Audio Magic/Quantum Physics Noise Disruptors, dedicated AC line with Wattgate 381 outlet, Echo Busters acoustic room treatments. Room size: 11' x 18' x 8', long wall setup, suspended hardwood floors with large area rug, walls are yer standard canuck drywall over Fiberglas insulation. Many of the images in this review were culled from the Duevel Planets site Urban Fidelity. Check out this clever mini YouTube vid on the Planets, too. The three color-inverted models below are Duevel's big omnis based on the wooden wave-guide dispersion lens technology shown in the cutaway drawing above. 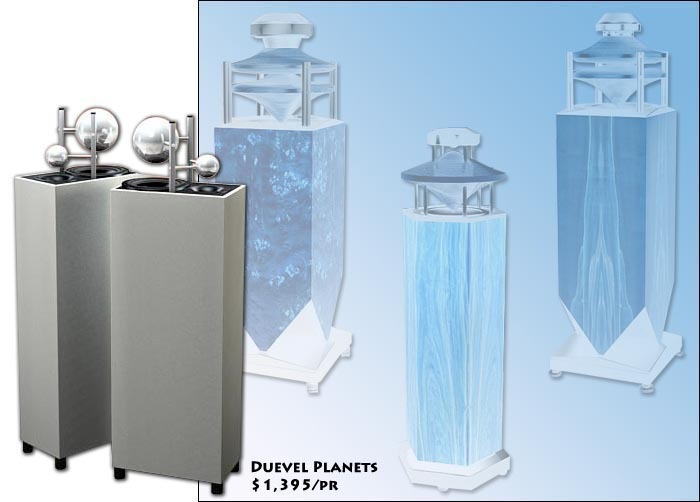 The Duevel Planets were the first omni-directional speakers I have had in our home. This odd-looking yet attractive speaker is a two-way design with a 5" poly woofer with inverted dust cap and a 1" horn-loaded soft dome tweeter protected by a stiff metal mesh grill. Instead of firing towards the listener as with most speakers, both drivers fire straight up into a pair of suspended hollow chrome spheres which disperse sound in a 360-degree pattern. 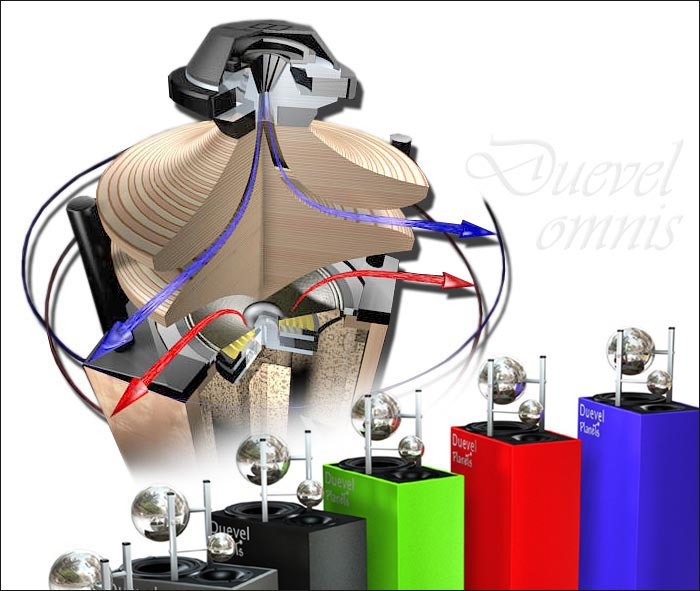 Duevel contends that the brain has difficulty in differentiating between direct and indirect sound of the more common forward-firing speakers thus causing fatigue. With Duevel's omni designs, the listener's room boundaries are deliberately energized to produce a more reverberant field not unlike what one would experience in a concert hall. Duevel believes this radiation pattern is more natural and therefore more easily processed by our brains. This is no doubt a controversial issue and I'm sure there are many valid counter arguments but if I've learned anything about audio over the last few years, it's that there are many paths to nirvana. It's up to you to choose which path to take. 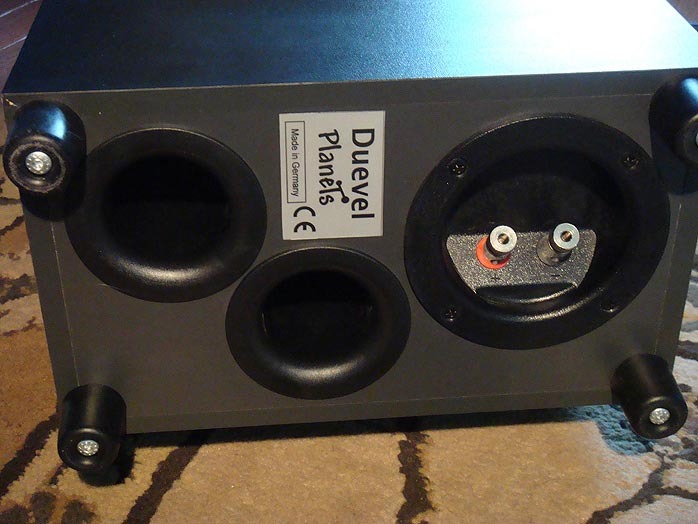 Incidentally, the Planets are not the first Duevel speakers reviewed at 6moons. Jules Coleman reported on the now discontinued Jupiter while John Potis tackled the Bella Luna Diamante. Do check out their reviews for further insights. The crossover is described as phase linear on Duevel's website, with a 4-ohm impedance and modest 85dB sensitivity. Standard finish is a black laminate but several rather vibrant colors are also available by special order. The MDF cabinets weigh 22 lbs and measure 32.7" tall, 10.2" wide and 6.1" deep. Situated on the bottom are a single pair of multi-way binding posts, two ports and four hard rubber feet. Fit 'n' finish was respectable although I wasn't keen on the bold 'Duevel Planets' script on the cabinet. Due to the location of the binding posts, forget stiff snake-like audiophile speaker cables. You'll need more flexible cabling such as my Auditorium 23 (bananas) and Audience Maestro (spades) which worked well. Thicker cables such as my spade-terminated DH Labs Q10 were impossible to secure properly . While omni-directional, the Planets were quite easy to position, in fact more so than most speakers I have auditioned. The Planets are mirror-imaged and Duevel recommends setting them up with the tweeters facing the side walls. After a couple of days experimenting with room positioning, I preferred the Planets pretty much where almost all speakers end up in my room - approximately 3.5 feet from the back front wall, 2 feet from the side walls, with tweeters facing the side walls. Conventional wisdom suggested that placement close to walls would be problematic. But then there's nothing conventional about these speakers. They worked fine less than a foot from the back wall of our TV room. Granted, soundstage depth was compromised but the presentation was not nearly as boomy and confused as I initially expected. Canadian Duevel importer Pascal Ravach of Mutine informed me that the Planets perform best on a hard surface as the ports are designed to function optimally at a specific distance from the floor. If positioned on carpet, Pascal recommends placing platforms (wood, MDF, ceramic tile or stone) under the speakers. I used a pair of Skylan Stands Damping Boards to great effect. Bass was far more defined and extended with the Planets sitting on a hard surface than on the carpet.